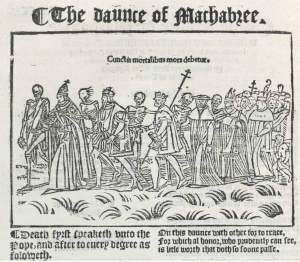 The first printed version from 1554: "The Daunce of Machabree"
The most famous dance of death in England was painted on the walls of the cloister at St. Paul's Cathedral in London. The author was the famous monk, John Lydgate, who had translated the text from a French original (Owte of the frensshe), which he had seen in Paris (And fro Paris / to Inglond hit sent). The danse that Lydgate had translated was the famous Danse Macabre in Cimetière des Innocents: (The whiche daunce / at seint Innocentis portreied is). Funny enough, The 1618-edition of Stow's book starts with this initial, but in a chapter that has nothing to do with the dance in St. Paul's. There was also one great Cloyster on the north side of this church inuironing a plot of ground, of old time called Pardon church yard, wherof Thomas More, deane of Pauls, was either the first builder, or a most especiall benefactor, and was buried there. About this Cloyster, was artificially and richly painted the dance of Machabray, or dance of death, commonely called the dance of Pauls: the like whereof was painted about S. Innocents cloyster at Paris in France: the meters or poesie of this dance were translated out of French into English by Iohn Lidgate, Monke of Bury, the picture of death leading all estates, at the dispence of Ienken Carpenter, in the raigne of Henry the sixt. The wording is a bit unfortunate in the 1603-edition and might give the impression that Ienken Carpenter had paid Death to lead people away: »the picture of death leading all estates, at the dispence of Ienken Carpenter«. The 1598-edition made it more clear that Carpenter had only commissioned the mural, »with ye picture of Death, leading all estates painted about the Cloyster: at the speciall request and dispence of Iankin Carpenter«. This is all we now about the state of affairs concerning the mural. All we know go back to Stow, and Stow has probably only used one single source. He was the owner of the manuscript Cambridge Trinity R.3.21, in which two different scribes in two different centuries have written precisely those informations that we have just read from Stow. The beginning of Lydgate's text. The Ellesmere manuscript (EL 26 A 13). 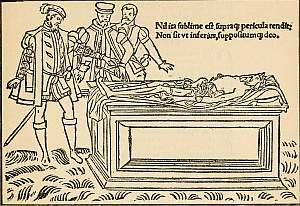 In the yeare 1549. on the tenth of Aprill, the sayd Chapell, by commaundement of the Duke of Sommerset, was begun to bee pulled downe, with the whole Cloystrie, the daunce of Death, the Tombes and Monuments; so that nothing thereof was left but the bare plot of ground, which is since conuerted into a Garden, for the pettie Canons. The King ligging eaten of Wormes. Fortunately the Middle English text still survives in ca. 15 different manuscripts, and in 1554 it was printed at the end of Richard Tottel's edition of Lydgate's "Fall of Princes". Since Stow has assured us that the mural looked like the one in Paris, the text in this section has been illustrated with Guyot Marchant's woodcuts from Paris, 1485. The Ellesmere manuscript uses the letter yogh, which looks like this: ȝ. Hopefully your browser is able to display it. The yogh is half G and half Y. It's used in words like ȝonge (modern English: "young"), ȝoure ("your"), briȝt ("bright") and ȝeuen ("given"). I will attempt to translate parts of the text into modern English. The Dance of Death, Edited from Mss. Ellesmere 26/A.13 and B. M. Lansdowne 699, collated with the other extant Mss. by Florence Warren with introduction, notes, etc. by Beatrice White. Unfortunately the book is no longer available on the Net. 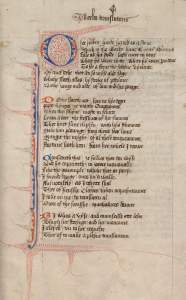 'Owte of the frensshe': John Lydgate and the Dance of Death. This is a single chapter from the doctoral thesis by Sophie Oosterwijk: 'Fro Paris to Inglond'? 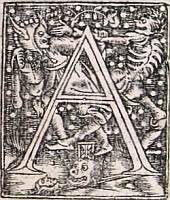 The danse macabre in text and image in late-medieval England. Three women are part and parcel of the dance, namely the Lady of gret astate / princess, the Abbesse and the Gentilwoman amerous. Many of the manuscripts add an empress in the margin, but this is not true for the Ellesmere-manuscript. However the empress is a regular participant in the so-called B-texts such as Lansdowne 699 and Vespasian A 25.